Phil: She has to run everyday or she goes crazy, she’s like a Border Collie. Although it's not everyday, it's more like every other day. And I am the smartest in the world. 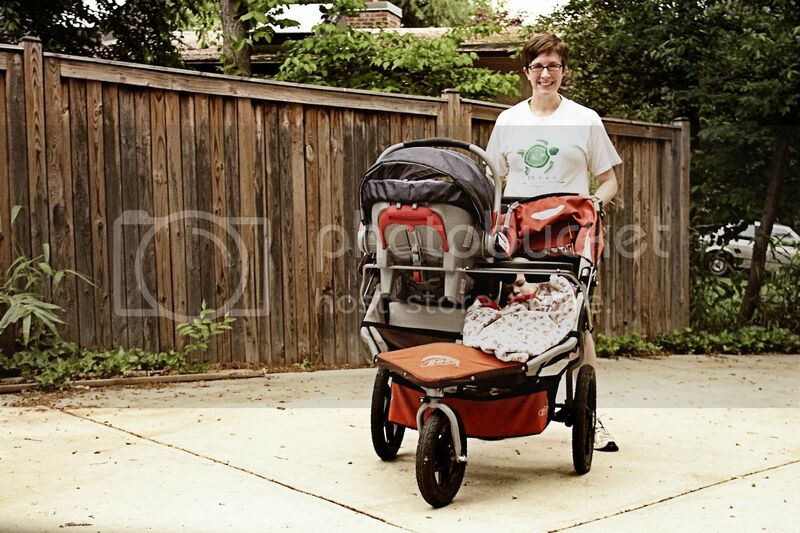 So here is me with the double BOB jogging stroller, which is the size of a small car. Even though I'm barely running 12 minute miles, I'm pretty sure it's actually 7 minute miles when I factor in the extra weight I'm pushing. I registered for the Richmond Marathon in November. While I don't anticipate any stellar times from this race (I ran the Marine Corps Marathon around the same time after having Finley), I still would like to do my best. I think I'll probably be a little faster than two years ago because I'll have an extra 5 or 6 weeks of running before the race. Being at home with boys all day... sometimes gets a little long. 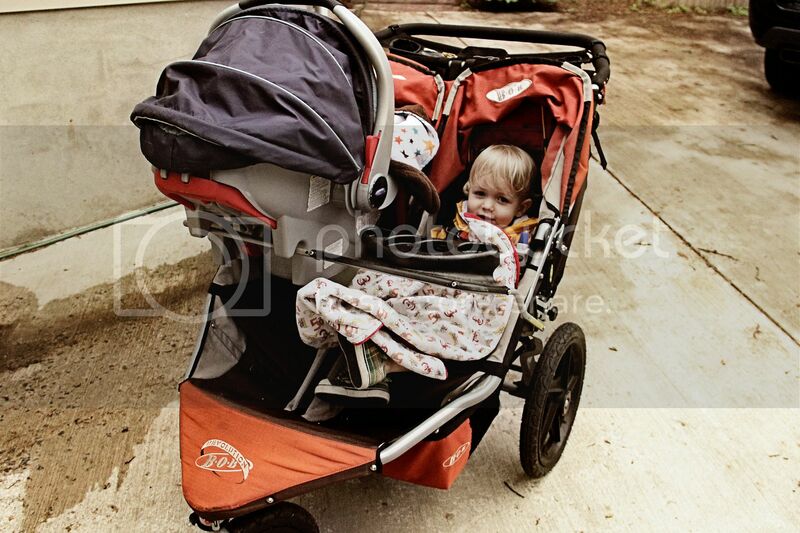 It's easy to strap them both into the stroller and go out for a run. That kills at least 45 minutes. Also, if Braden has a hard time napping then the stroller will do the trick. I would like to fit in my old clothes again. Running helps. Nursing Braden helps. The way I eat does not help. But two out of three... that's something. And this is what Finley looks like. Finley is funny to run around with. He likes to tell me the color of every car and talk about the leaves and sticks and other fun things we see. And he likes to yell, "SLIDE PARK!" when we get close to the park. you are amazing! I can't believe you're pushing that heavy stroller around! And on that note, Grant has been wanting to take Vera out for a jog in our BOB. I thought we needed to wait until she's bigger - do you think she is old enough now? She's 5.5 months, so I'm thinking without the car seat. Advice? Wow. didn't know they had baby car seat gizmos on those strollers. Good luck training for the race! I think that with a little motorized mechanism for assisted power on that stroller and a gps with a homing device for ice cream shops would make that just about perfect. You know, I think I saw something like that on the road the other day.